Sakhalin is a giant island in Far Eastern Russia in the Northern Pacific Ocean. It lies in Siberia, almost 6,400 km (almost 4,000 mi) from the Russian capital in Moscow. 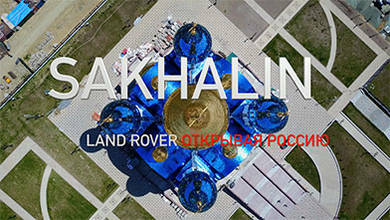 In this remarkable video, contributor Vision.One used a drone to create an aerial perspective of an off-road event on Sakhalin organized by Land Rover. The video follows a group of 4x4 land rovers as they trek across this enormous yet remote island in the far reaches of Northeast Asia. Description: An epic journey through the wilderness of Sakhalin Island, Russia. Drone aerial video capturing amazing beauty from above.